It only comes once every four years. And it’s not the World Cup, the Winter Olympics, a U.S. presidential election, or leap year. It’s The Show. That’s right. The Show—a quadrennial exhibition of what we’re willing to call talent for a couple of hours, performed by Randolph faculty and staff for students. The performance is scheduled Feb. 19 at 7:30 p.m. in Smith Hall Theatre. Tickets go on sale Feb. 11 and are $4 or $10 for a combination ticket that includes an official The Show T-shirt. This year’s theme is “The Greatest Show,” inspired by the musical, The Greatest Showman. This year’s iteration of The Show will feature singing, dancing, and other “unique” performances. The Show dates back to 1915, when faculty and staff staged a performance to raise money to build what is now Smith Hall. After other occasional performances, it became a once-every-four-years midwinter tradition beginning in 1948. Students, mark your calendars for this once-every-four-years opportunity! 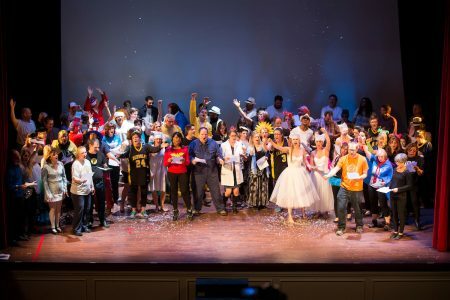  Faculty and staff will perform and share their “talents” in THE SHOW on February 19 at 7:30 p.m. in Smith Hall Theatre. Tickets will be available starting Feb. 11! Use the link in our bio for more info.